yeah, i get a little homesick around this time of the year. heck on my pinterest my "dreaming of summer" has the most pictures in it. ah yes. i miss my ocean. case in point. this bracelet, brought a flood of memories, not because i used to have one like it but because i can totally see me wearing it by the beach, not caring that it's gotten salty and wet, because i can totally make another one in like less than 5 minutes flat when i get home. it's simple, and it's perfect to dress up your bathing suit, or your cute summer covering with your flip flops in tow, or wear it with your cute summer dress while you dine eating fresh fish while watching the tide come in and the sun set. i guess you can take the girl out of the beach...but not the beach out of the girl. i'm counting down to my visit to so.cal. and i can't wait to actually wear my bracelet at the beach. but for now...i'll wear it even if there's snow and winds and i'm encircled by mountains. 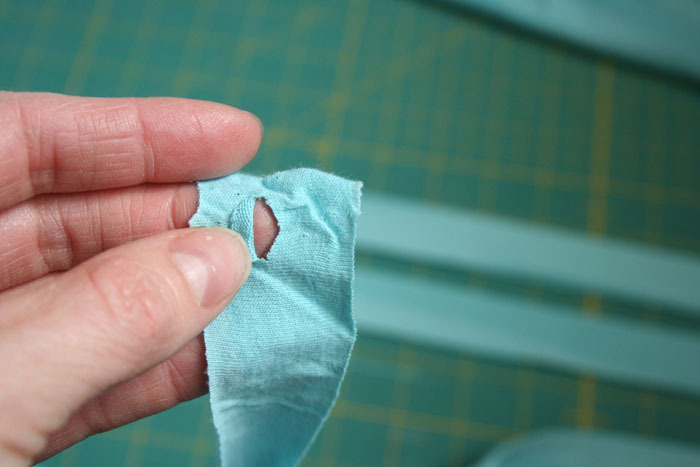 *1st you will need approx three strips of jersey knit fabric cut to 1" each with the length of at least 58"
*2nd you will need your fingers. that's it, oh and a pair of scissors. how many fingers you use will determine how thick your bracelet will end up. i'll go into more detail on the 4 and 2 fingers...i'm assuming you can figure out 3 fingers! personally my favorite one is the 2 finger one...it's the perfect thickness in my eyes. *first you are going to take your 1" strips and cut on your ends a 1/4" slit. *next take your slits and line them up ends together like the picture above. *gently pull till you get a little knot. now a lot of you will go back in time with me and totally remember doing this with yarn when we were in grade school or somewhere along that time. dont' know if it was a california thing cause i asked my friend who grew up in florida what i should call this and she was like "what are you talking about? i've never made those." 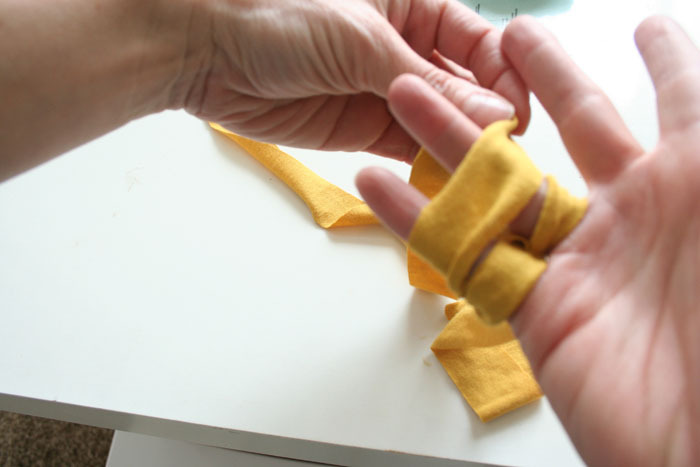 *with your connected strips we are now going to weave the strip in and out of our fingers. 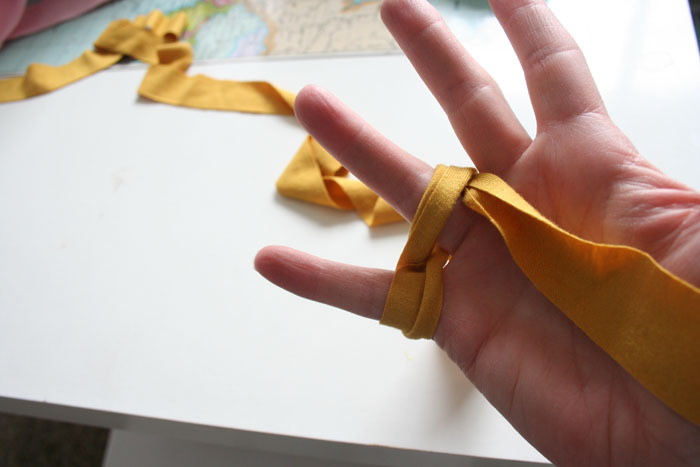 start off with weaving behind the pointer, in front of the middle, behind the ring, and in front of the pinky finger. then wrap it around and behind the pinky, then in front of the ring, and behind the middle, and then in front of the pointer. 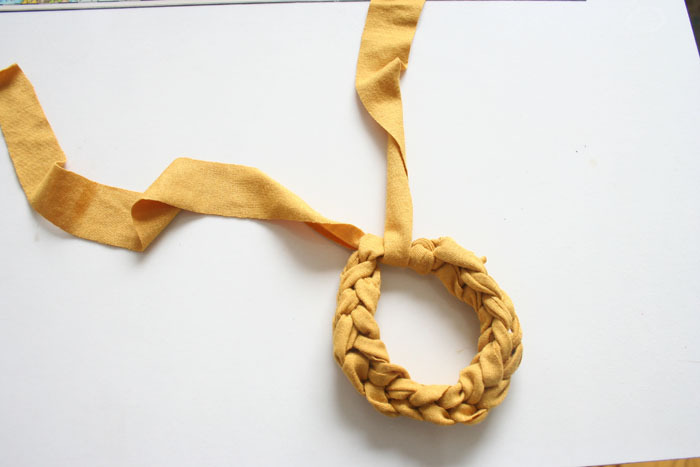 *take your weaved loops and go over your finger and big loop like the picture above. *continue to do so with all the fingers going in order. *when you get to the end, or at the end of your first chain (at your pointer finger) make a new loop and start the process all over again! * once you get like 6 chains done, take your starting tail and gently pull (while your chain is still securely placed on your fingers!) so that you can get a good feel as to how long you need to make your chain, depending on your wrist size. *starting on your ring finger, weave behind (your ring finger) and then in front of your pinky. *then come back and loop back in front of your ring finger. *come back around from behind (from the pinky side) to the front to make a big loop. *repeat the steps i showed you while doing the 4 finger bracelet. *remember to pull your tail so it makes the chain more defined and it gives you a better idea of how long you need to make your chain. *once you've determined you have a long enough chain, carefully pull the loops off your fingers, making sure you don't undo any of the chain by losing the loops! *slip the extra tail into both loops. *pull all the way through, and gently tug the end. *tie off your bracelet with a knot. and top view of thickness. and now you are so ready to hit the beach, pool, lake, or heck the grocery store. cause yeah, they are that cute. now available: KITS sorry sold out. but thank you! and ps: i'm making a video for the few of you needing a video...just need to get the 'ol tri pod out. stay tuned. are you so ready for summer like i am? Er. . . the two finger width bracelet just looks braided. Why wouldn't you just braid it? It would be way faster and use less fabric. Adorable and quick...two of my favorite things in a project! Add the Abby bag to your outfit and you are rockin'! Thanks for the quick how-to. Smiles! LOVE this!!! Thanks for showing how to make it. I just pulled out a shirt from my dresser (my stash of trash shirt that I use in such cases like this) and am ready with the scissors. Love your blog!!! Very cute, and the 2 finger one looks better than braided to me, too ;). It's no wonder our home is full of various shades of blue...sheesh. I feel your pain! I didn't grow up on the beach but I am a Cali girl too and my parents grew up in San Luis Obispo, so I have beach fever in my blood :-) I really love these bracelets but I must have missed the memo cause I have never made anything like this. But I will definitely be starting now! it was 80 here yesterday and we are planning on a trip to the beach this afternoon! not to rub it in or anything. I wish I had some knit! And of course I love that aqua knit!!! okay, so this totally brought back memories... not of the days walking on the beach (i have lived among the mountains my entire life!) 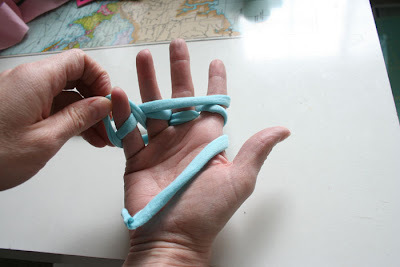 but memories of creating chains with my fingers and yarn- yes, i did that quite often! 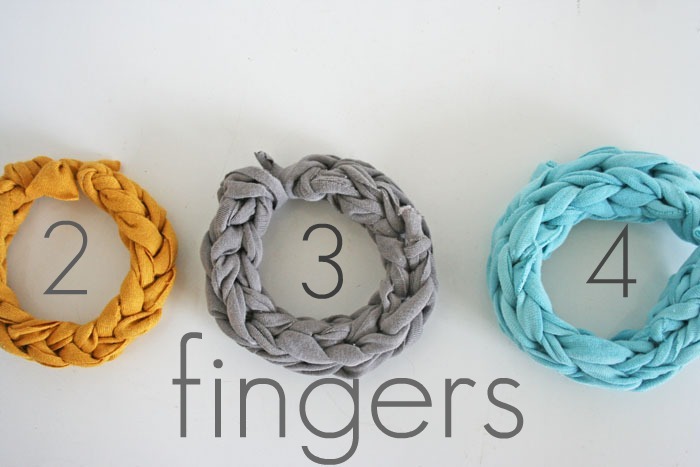 i am so trying this in every size: 2,3, and 4 fingers. because it's uber cool like that! so cute, thanks for sharing. I'll be making some of these as soon as I find cute jersey fabric! Nice! I never thought to reduce the amount of fingers for a different look. THanks! I love this tutorial! Can't wait to make some for my friends. I always miss my family around this time of year too!!! I am a transplanted spud from Idaho and I miss the cool nights and leaving to windows open at night!! Totally love the bracelet! I can't wait to make it! love this! can't wait to try one-my girls will love it too-wearing them and making them! This is so stinkin' cool! Love it! its gorgeous, and complicated for some one like me, i spend 3 hours trying to make it nothing. Love this! 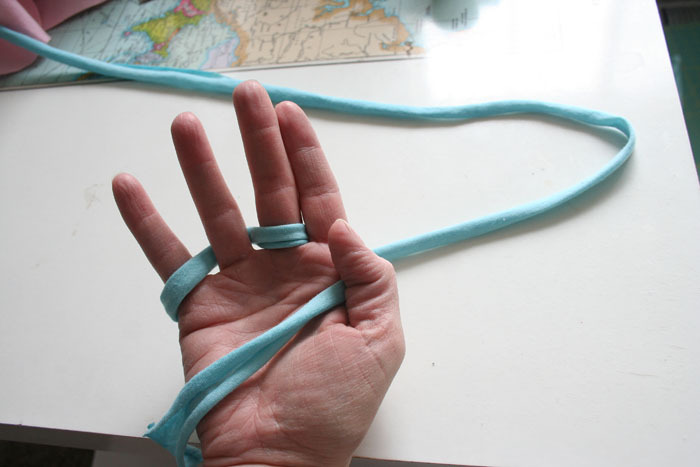 I just made a 3 fingered bracelet in an aqua jersey almost identical to yours. Fast and cute! I have linked your post my blog. www.robinsnestquilting.blogspot.comThank you for the tutorial. I'm thinking that I could find something at the thrift store to use, also. Maybe that would cost more??? Oh, I am so SoCal girl as well but married to military we are not there, snow and mountains/plains for me (at least for now). Was so fast and easy to follow...I made a red one while reading the how to...it's a perfect gift to give my friends!!! Thanks! I love this! You are so creative! this is a FANTASTIC idea! i love finger knitting! and i just added a bunch of hubby's t-shirts to the donate pile...out of that pile and into the fabric pile they go! I am from SoCal and we called it "finger knitting" I'm not sure that the tremonalogy is exactly correct, but that's what we called it as kids :o) We made scarves out of yarn - never tried it with jersey before! I had totally forgot about it! This is very cute! love it! 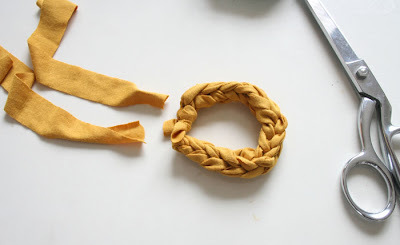 Good idea for a headband too! 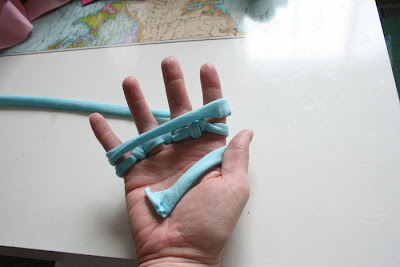 That's called "finger knitting" - and is used a lot in Montessori schools! Very cute! Thanks for sharing! I like Thirty-One Trendy Totes' idea about a headband, too! Love the idea! I'm making a couple from old t-shirts tonight. I enjoyed hearing about your inspiration on Pat Sloan's Podcast too. omg...lol! We used to do that with yarn when we were kids. So much fun to do on those rainy summer days. I agree you can not take the beach out of the girl. love it. just made a couple from t-shirts! 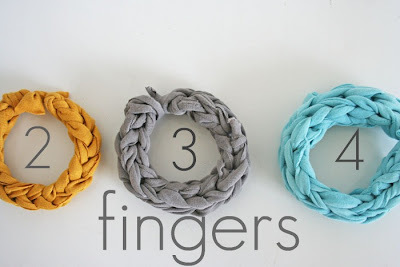 i have always played with finger knitting but never thought about doing it with anything other than yarn. thanks for the inspiration. Love these1 I made yarn finger chains in second grade, right here in Utah! Thank you Mrs. Anderson! Well, I'm from Ohio and we used to finger knit while wasting time in studyhall. So, it's definitely made the span from one coast to the other at some point. I love how summery and fun this is! Love it! Ohh, I love this! I just made a yellow one from some jersey I had lying around. I think I will have a go at teaching my kids how to do it! Oh my word, I did this when I was five, but never knew what to do with my chains. Your bracelets are so cute! Oooh pretty! I grew up in the midwest and have never heard of this way of making a bracelet...me likey!! Way cool! Love how customizable these are! I'm totally making these. Then I will blog about it (linking to your fabulous tutorial, course!). Thanks! Thank you! This was a lot more fun than doing what I really should have been doing this morning. It took a few attempts to get it right (I was weaving over every other finger), but once I figured it out correctly, it was a total breeze. I remember doing this with yarn when I was little (and I grew up in Colorado). Super cute and such a fun easy project to remember. So cute!! Thanks for sharing!! I love these! So much that I want to just buy them!! I love this! :) I've been wanting to make these! I actually linked this on my blog! Check it out if you're interested! Love these! They are so cute. However, it took me forever to figure out how to do it. 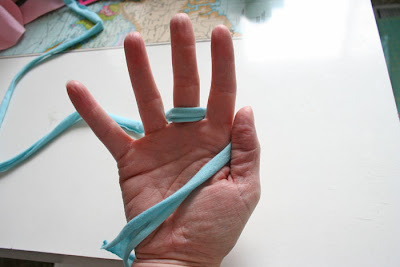 So in case anyone gets caught up where I did here is my experience: At the end of my first chain I wove between my fingers again which obviously didn't produce the desired result! You just make a new big loop across your fingers and pull the already weaved loop up and over your fingers again. Then repeat. Thanks for the tutorial! 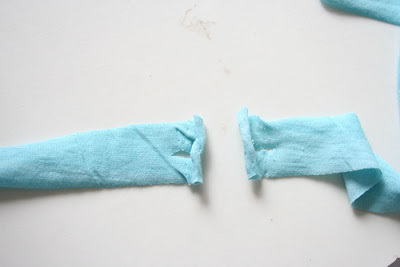 next to my house, there are several clothes workshops that put in the streets lots (but lots) of bags with fabric "scraps"; olivia loves picking them up, she has made lots of headbands, but this tutorial is ideal for this scraps!! What a super fun idea. My girls will have a blast with this. 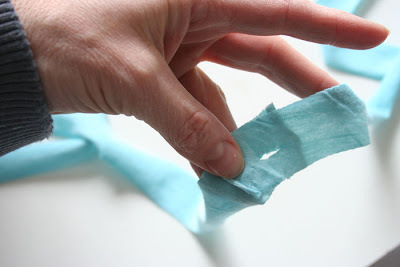 One idea you can use is to take old shirts you might throw away because of a stain or something and use them for these. I think I'm a little obsessed with these. And I think this is the perfect way to upcycle the scraps of t-shirts from a t-shirt quilt that I made for my husband! My daughter and her friend are making these (in lavender) right this minute. So fun! Thanks! Do you think you could post a video?! I think that would be really helpful! I freaking LOVE these! Adorable and super fun. 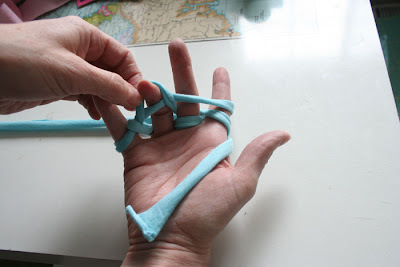 I grew up in Houston, and like some other commenters, learned this as "finger knitting." It was a huge fad in my second grade class, and we all (boys included!) brought yarn to school and finger knit during class. Our teacher was clearly awesome. Anyway, we made loooong chains to use as Christmas tree garlands, but you could make any kind of garland--just keep your chain going! Ok, maybe it's just me but it looks complicated. :( I will have to test it out. Any chance of getting someone to do a youtube video? Now THIS is jewelry for everyday wearing! Three hours of frustration. Wish I could have figured it out! Super cute tutorial! okay okay i'll make a video of it for the few that have requested it. will let everyone know when i get it up. WOW. I might be completely stupid but after 5 tries, and reading the tutorial about 20 times, I still can't get it. Can you possibly do a video? I really want to make some of these to take on my Caribbean excursion at the end of April! Very good idea!!! I love it! Thanks! Love these...so pretty and funky! I just made about 15 of these while watching a 1 hour tv show. SO easy and SO awesome! I think I'll be giving these as gifts to all of my girl friends! Thanks for the great tutorial! Once I figured it out, they were great to do! I used an old T-shirt which worked great. I just pieced all the pieces together as needed. I didn't worry too much at keeping it an even 1" wide, I just ripped the knit (didn't know that even really worked) and it wasn't straight, but the varied widths look pretty cool. Great tutorial! Finger weaving!! I used to do that all the time as a kid with yarn (in CT!). Love it! Good luck with the big changes coming up. Keep on canning! I love this! I went and bought three knit jerseys last night! Too bad I can't figure it out either - mo idea how to get teh knot started and know idea what to do with all of the strands! Am I an idiot? Haha :) Can't wait for the video! Three strips of jersey knit fabric cut to 1" each with the length of at least 58" = 174" That's 14.5 feet of material...! OH HOW I LOVE THESE...Sadly...I am lost at the instructions...it is not you...it is my lack of craftiness! So...I guess I will never have one! Thanks for letting me LOOK at them though! LOL Have a great week!!! okay all, i'm going to make a video hopefully later today so stay tuned! Very nice! I had only seen this done on all 5 fingers to make a knitted tube, but not completing the tube makes a lot more sense to me. Thanks for sharing! V and Co...what a great World you have over here!!!! Cute Idea... must have a go! This will be a perfect activity to do with my girls on the next rainy day. Love it!! Love these! Thanks for the great tutorial. i'm gonna make some of these!!!thx!! Muriel (from Switzerland) who juste made one ! You did a very nice job with these bracelets! I'd like to try to make them too, but I'm french and I don't understand "(*1st you will need approx three strips of jersey knit fabric) cut to 1" each with the length of at least 58"", also how long my strip must be? Reading this tutorial I was suddenly reminded of doing something similar when I was a little girl, though I can't remember what, exactly. I'm sure it wasn't these bracelets I made, but it was some kind of finger knitting (rather than finger weaving!) Thanks so much for the tutorial. I'm excited to give this a go. So crazy! I grew up it so cal and finger knitted with yarn all the time. I literally just taught my daughter how to do this yesterday and found this tut today! Cant wait to try it with jersey knit. I can't wait to make one of these for myself! 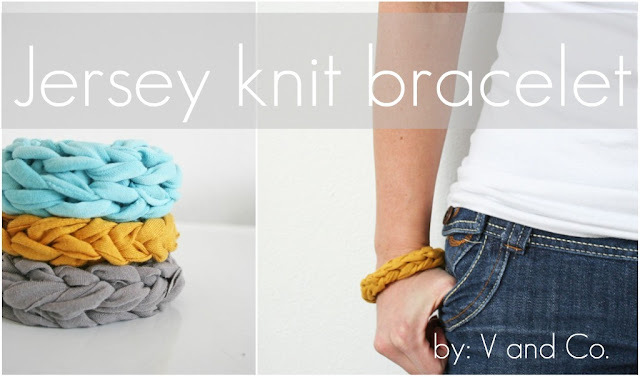 I also included this in a roundup of bracelet tutorials for those who want to help with Craft Hope's latest project! I cant wait to try this! Thanks! My girls (ages 9 and 5) and I did these on Easter and they are now obsessed. They are giving me every old t-shirt to cut into strips. It was so easy, fast, fun and cute. The perfect combo! I made a four fingered one and a two fingered one, both out of recycled t-shirt fabric. SUPER cute! I like the casualness of the two fingered one and the more dressy feel of the four fingered one. My sister immediately stole the two fingered one. So now I will have to make myself another! Thanks for the project! I think I will make some for stocking stuffer gifts this Christmas. Please have a look at mine! This is awesome. I recently had a nephew pass away and will be making a t-shirt quilt out of his shirts. I think making some bracelets like these for his mom and cousins out the remainder of the shirts will be awesome! Thanks for sharing! I love your website and all your tutorials. I have featured you on my blog. This is so cute!It must have skipped Florida because I have never seen this before!Love it! I love the creativity of the bracelet! They are pretty as well! So I tried to do this and it was a complete fail..i don't understand how yours turned into a chain...mine ALWAYS falls apart no matter how carefully I pull them off my fingers. I know I have to be doing something wrong, but I can't figure out what it is. HELP! LOVE these bracelets! I have my fabric cut and I'm ready! I noticed that you said a while back that you were going to make a video for these. I can't find a link to it. Did you do it and I'm just crazy for missing it? Thanks! Can't wait to do this! Whenever you bring the loop around for the first time, is there a loop on the back of your hand too? I'm tempted to braid it but yours are SO much cuter! 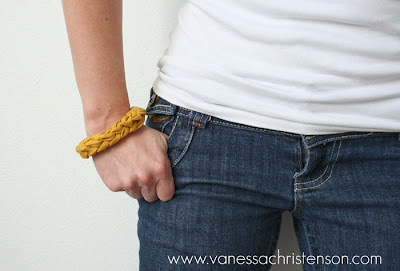 Over at momcoloredglasses.com, we are on the same wavelength...we posted a DIY knit bracelet as well with embedded beads to inspire our readers to make bracelets for kids in Russia! We need to add this version to our collection - they would love them! I absolutely love this! I used to make something similar to this when I was a kid but had forgotten how do it. So glad I found your post! i must not be following the directions cause when i do it falla aprt when i take it off my fingers...and i dont know how to get it to be long and tight like you have it in the picture...itsfrustrating because it looks so beautiful! ok, this may seem like a stupid question but...what's with the slits and the tying? is that just to make it longer...like would we still need to do that if we had a long enough strip? such a cute idea! just in case anyone was wondering...not as cute with knit ribbing. i had some left over from a blanket binding and thought i would try it out. I'm excited to try to make these, but i'm a little confused. Maybe i'm not reading well enough (i'm making the two fingered one), but why do you need more than one strip of fabric? And what purpose does the knot serve? I used to finger knit all the time when I was growing up! LOVE this! I always just used yarn, tshirt strips never even occurred to me! BRILLIANT!!!! This is so cute! Thanks for the tutorial! This is so cute & seems like such a fun summer project for tweens & teens (and moms). Featuring it on Dollar Store Crafts on Sunday! Can someone who has actually figured this out please post a how-to video? These are adorable, but I'm super confused. Thanks! the bracelets are adorable, however I must be incredibly challenged because a friend and I were unable to understand the directions and could not successfully make one :( rather disappointing. If you do decide to post a video that would be lovely. thanks for the great idea, maybe one of these days i will actually figure it out. yea..me too..is there a video tutorial for this? I learned it in grade school in So. Cal too!! We called it Finger Crocheting!! i think these are cool an trying to make my frist one but confused on where to go after i fill my filled my figers up how do u refresh ur fingers to keep going. a video would be awesome. Hey, just wanted to say it is also called finger knitting... 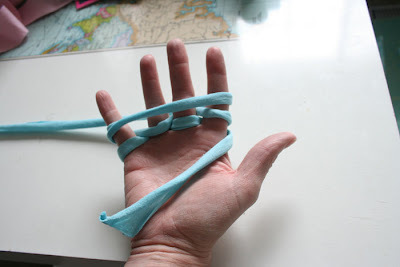 I have know how to do this since I was about 5, it is really easy. And Yes VERY fun, I can do it while watching television or talking with friends. Hey--this was a fun idea. I remember doing finger knitting with yarn, but I never thought about using jersey to make a bracelet! 1. 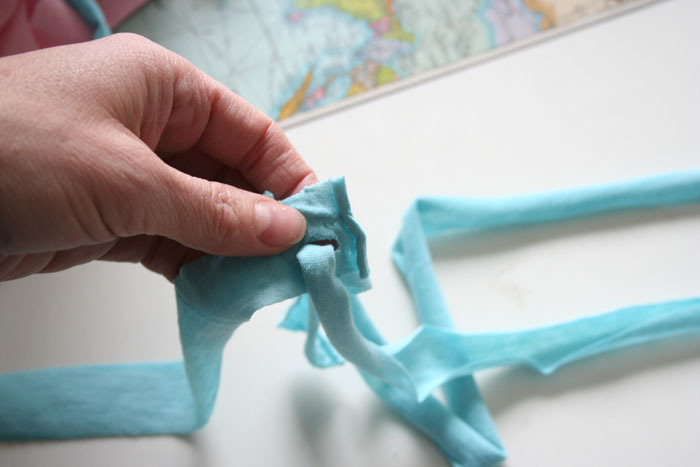 The knotting part at the very beginning is just to put the three (or two) lengths of fabric together. If you're making these by cutting a spiral out of the bottom of a t-shirt, you don't have to worry about this step. 2. For the knitting, you basically start with figure eights around your fingers. Then you loop a strip of fabric over the figure eights, and then you pull the figure eights over each individual finger, like in the pictures. Another mistake I was making was trying to alternate which direction I made the loop. 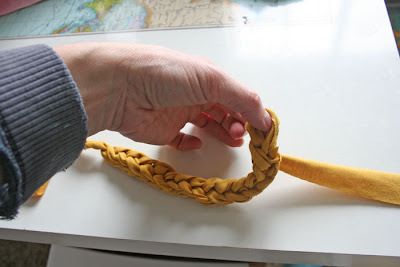 Whenever you finish doing a weave, the long end will be coming off the back of your hand in a certain direction--for example, with the way she did it here and with how I did it, it's towards the pinky side. 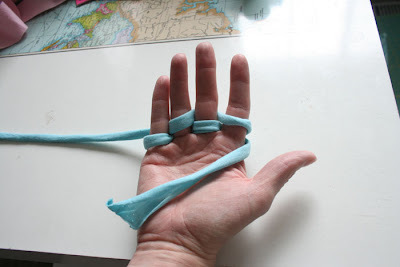 If that's the way you're doing it, too, then you will loop the long end over your fingers toward your thumb, and then you'll do the weaving steps again. Every time, you should loop in that direction. I hope that helps if you're having problems... these were just some things I was having trouble with; maybe this can help someone who is having trouble too! Very cool! I had trouble figuring out he knot in the beginning but when i finished it looked very cool. thanks for the awesome idea. I also used just a knit fabric that was textured so it came out with a different feel than the jersey knit. Thank you so much for easy to follow instructions on this project. I did these with a group of middle school girls today and they had a blast. I linked back to you for your great instructions. THese creative girls took the bracelet design in some different directions and made anklets and headbands. They even added beads. It was a lot of fun! 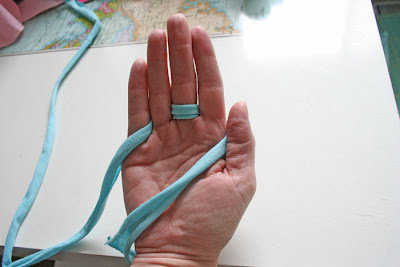 I found this tutorial this morning, and withing 20 minutes I had a cute teal bracelet made! I just used an old tshirt. Totally appreciate that this was quick and didn't involve sewing! Great video too! I just taught my five year old how to make these! Thank you for saving us from boredom! How old were you when you made these as a kid? Was thinking this could be a fun VBS project for the older ones. Just made this- super cute! Planning on making one for my mom on her birthday- she loves them too! 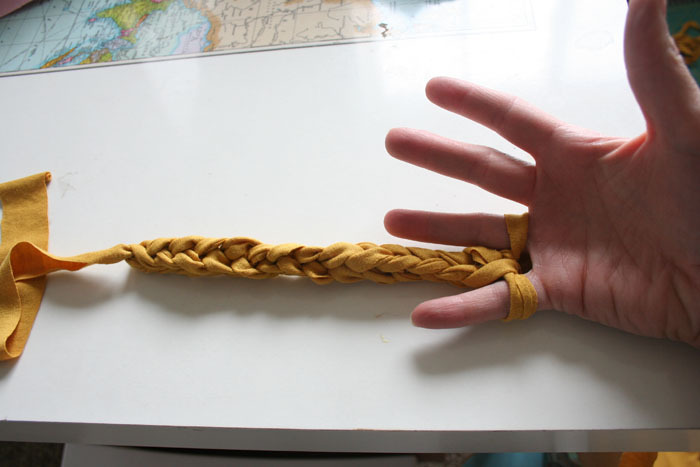 Wanted to make one with a rope... but still have to find one that would be soft enough for a bracelet. Any suggestions? My mom loves all this nautical stuff- can't wait til she sees it! I just tried this at least ten times. Not working. And I'm following the pics and words precisely. Others that were able to follow must have the previous experience. I'm pretty good at deciphering instructions, taught myself to knit that way, but these directions are missing something. I am having trouble with the jersey fraying. Anyone else have this happen? Is there anything I can do to prevent this? I am having trouble with the jersey fraying too! We found another fabric with spandex in it and that worked, but the only color joann has is a plum. We want the cute colors available in the jersey... but it's fraying rather than rolling and looks a mess.... ?????? I used ebroidary floss after using the jersey fabric...and it turned out really well. These are fantastic! I am totally craft-impaired but really tempted to try these! Hi There! Your tutorial and vid is awsome! I tried it and get addicted. Super cool tutorial. 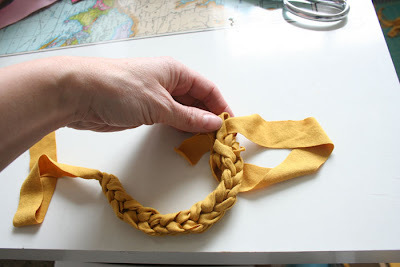 I cut up some old t-shirts and just made a headband using the same technique (just have to make it longer than you would for the bracelets). thank you for this great tutorial! my little daughter loves her bracelets! Great idea! We call that joining technique splicing. I'm going to give this a try with some leftover t-shirt fabric soon. Thanks for the tutorial! 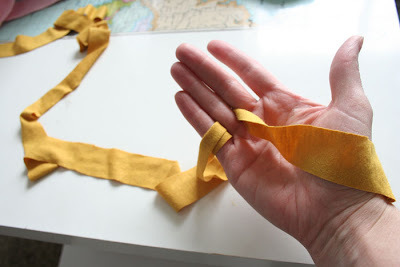 Ok, I am a bit confused so here is my question... if you are using three strips after you cut the slits in the ends do you stack all three on top of each other and then pull the bottom strips end through to make the knot or do you do them end to end (like end of one to end of two and other end of two to the end of three)? I will feature and link in a future blog post so others can come visit. I love these! I had a question though about the fabric. When I made one, the jersey frayed and made it look messy, not as clean as yours. I'm curious if you treated the fabric first or did anything to avoid fraying? Or am I just getting cheap jersey? Got it from JoAnn. Thank you so very much for this ! I will also bookmark this and feature it in a future blog or Facebook post, please. I am deeply into recycling, upcycling; currently crochetibg bags using Tshirt Yarn. Good thing I surf the net on how to make a bracelet and find your site.I really like your jersey bracelet and Thanks also for including procedures for us to have a easy guide in doing the process. Great idea ~ thanks for sharing!! Cuuuute, I'm definitely trying this! HI, I love this idea it is so great but i can't seem to get the same look as yours. How did you get the edges of the fabric to roll up? I bought some at JoAnns and it just isn't doing the trick once i finish the bracelet all the frayed edges are visible and it just looks tacky. I tried ironing the edges and that didn't work either. Any suggestions? I hope you do mind me linking this to my blog. www.brendawritesablog.blogspot.com. I will put a linkback to you, of course! Brilliant idea, LOVE the bracelet. I love this! I just made two, using two strips of black and one of white it's a really cool colour-blocked look! LOVE it. Thank you for this tutorial! My older kids 6-13 had a great time making these during conference...and it kept them still and quiet so that I could listen! So cute, thank you so much! Made it... Love it.... And am now converting t-shirts Ian these and matching scarfs!!! This is a great technique! I also used the 2-finger method to made chain belts for my daughter, she LOVES them! Just follow the directions to make the bracelet, but keep going until it fits around the waist. ( takes about 5 strips for a 2-year old) You can also make a multi-colored bracelet or belt by alternating colored strips when "splicing" the jersey fabric. 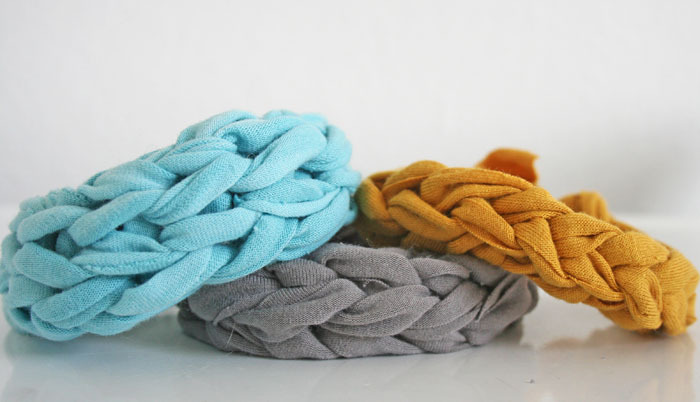 These bracelets are super cool! I was making one of these just now and my brother-in-law (both of us are in our mid-20's) was like, "hey, that looks like the kind of chain you'd use Hot Loops to make!" Definitely, not a California thing! I grew up in MN and he grew up in ND and we both "recognized" this weave. Super cute bracelet too! (I did the two finger). I found the following video helpful as well: http://www.youtube.com/watch?v=rOc353OYYPg . I also used 1" satin ribbon for the 2-finger weave, and it turned out beautifully! 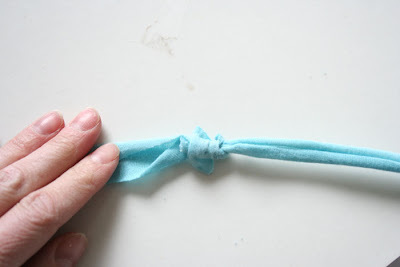 Just melt the ends of the ribbon on the stove so they don't fray. Is it kinda a west coast thing? I grew up in hawaii and we would make leis like this out of yarn. My daughter has some old t-shirts that I've been wanting a project for. This would be perfect--she loves bracelets. Could you make a necklace length?